As many readers will know, the release of my new book, Unraveled, is imminent. The preview option on the KDP site shows my book cover as it would look on an iPad. So I just wanted to give a brief rundown of what exactly is happening, lest some of you think I’ll be talking about this fictional book forever and I probably haven’t even started writing it yet [I have]. Also, I have a hunch that this may be useful for those of you who may want to possibly at some point release your own book, but don’t quite know how to go about it. For now I think I’ll leave out the whole discussion of self-publishing vs. traditional publishing, because it’s another kettle of fish entirely and if I went there I’d still be writing this post next week. Suffice it to say that there need to be, in this day and age, some very good arguments for going the traditional publishing route … and doubtless there are. Conversely, there are also some excellent arguments for doing it yourself. Two of those arguments are 1. Amazon and 2. Amazon vis-a-vis CreateSpace. It all starts here. I started writing this novel almost ten years ago when I visited a lovely fishing village on the West Fjords that kind of captured my heart. When I left I didn’t really want to leave, so I decided to start writing a novel set in that village, so I could stay there a little longer, in mind if not in body. I wrote about half the novel, then stuck it in a drawer where it remained pretty much until 2011 when I decided to finish it. Of course it morphed into a whole other animal in the process, but that’s par for the course. Incidentally, seeing as how I’ve written a fair bit about narcissism-slash-psychopathy in this space over the past while, I should mention that this is one of the themes in the novel. I’ve written before about the editing process, or more specifically, working with beta readers. In effect, the editing was crowdsourced, and it worked out exceptionally well. My beta readers were fantastic and really helped make the book. Those of you who know my other books will know that, until now, my self-published books have all been eBooks. The first time I did this, I released Living Inside the Meltdown as an electronic download in PDF form. Then came The Little Book of the Icelanders, which I decided to release both as a PDF and ePub file. Meaning that those who bought the book got two files in zipped form. I did this because, by this time, so many more people had eReaders than when the first book came out, and ePub is either the file of choice for eReaders OR it is easy to convert to something else. That “something else” is usually .mobi, which is the file that the Amazon Kindle reads. My third eBook, Icelandic Folk Legends, I released as an ePub file only, since by that time people were either reading those books on eReaders or there were excellent applications for reading ePub on a computer [my favorite is Adobe Digital Editions, but there are others]. The Little Book was quite popular, and I soon noticed there were quite a few disgruntled people who wanted to buy it in printed form but couldn’t. A printed version actually appeared later when I made a deal with Forlagið publisher, who released it within Iceland. [French and German versions are about to be published as we speak.] However, those hard copy books were not available for purchase outside of Iceland, unless they were ordered directly from Forlagið, which was [and still is] very costly. SO. 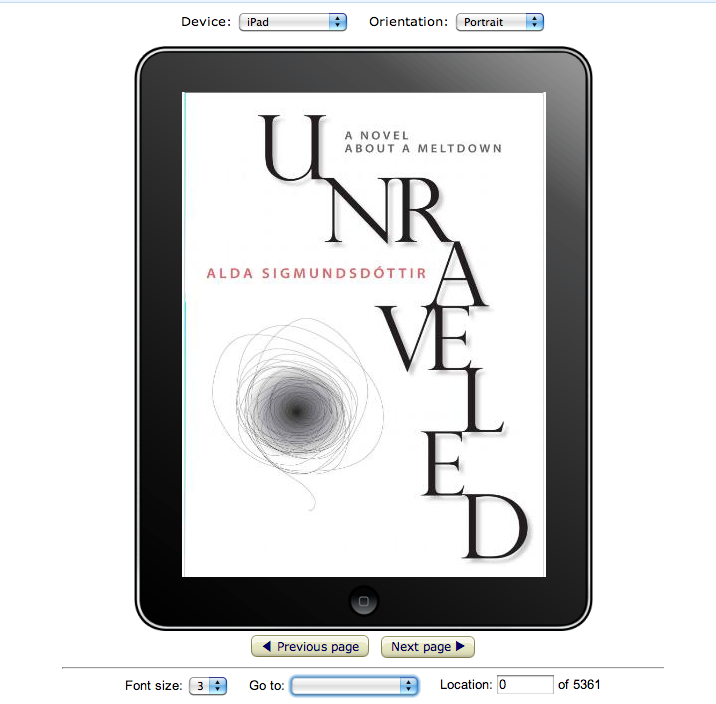 For Unraveled I have decided to have not one, not two, but three different formats: one version in ePub, one version for Kindle, available through Amazon [it also works for iPad], and a printed version through CreateSpace, an Amazon affiliate that prints copies on demand and sells through Amazon worldwide. The nuts and bolts of doing all this is something I’ve been learning about as I go. Thankfully if you’re reasonably web- and computer-savvy it’s fairly easy. ePub. To format an ePub book is probably the most difficult. That said, I understand you can do it using the latest versions of InDesign by simply saving the file as ePub. But as I don’t know my way around InDesign I used a very rudimentary eBook editor called Sigil. To actually read your book, though, you need to use another program, as Sigil just gives you the bare-bone files. For that I prefer Adobe Digital Editions. Kindle Direct. To format for Kindle Direct Publishing [which makes your book available as an eBook for Kindle and iPad worldwide] there are excellent instructions on the Amazon site. Basically you create an account, then format your Word document according to those instructions, upload to Amazon, and they have a preview feature that allows you to check your work before publishing [see the photo above, which gives me a preview of the cover, in this case for iPad]. If you need to change anything, you do so in your Word document, then just upload again and overwrite the original file. Really, it’s ridiculously simple. I reckon the main reason CreateSpace can provide this service at this low cost is because you essentially do all the formatting and preparation work yourself. The good news is that they make this INCREDIBLY easy – way beyond anything I could have envisioned. They take you through the entire process step-by-step with a really simple, intuitive interface. They also provide templates for various sizes of book – you download a template, stick your text in there, check it carefully, upload it to the site, check out what it would look like when printed, and submit. Once you have both your interior and your cover submitted they review everything and let you know within 24 hours whether it all checks out. If it does, you’re good to go. This is perhaps the most tricky – and costly – part of the whole process. Everyone who is doing their own publishing online really, REALLY emphasizes the necessity of having a stand-out cover that looks professional and catches the eye. The consideration here is also that it must be designed to stand out as a thumbnail, and not just as a stellar-looking book jacket. Obviously that’s because your book will primarily be marketed online, and on Amazon and all these sites that’s how the cover appears – as a thumbnail. So the title needs to be large enough to be visible, and so on. CreateSpace provides templates for covers, and they also allow you to upload your own print-ready cover. I happen to be incredibly lucky to have one of Iceland’s most talented graphic designers [my husband] at my disposal, so great-looking covers aren’t a big issue for me. But again, having a stunning cover is really important, so you may want to splash out for a professional design if you’re serious about getting your book noticed. I’ve just noticed that this post has run on to over 1,400 words, which is WAY too long for a blog post – and I haven’t even addressed the aspects of pricing, royalties, distribution, ISBN numbers, etc. So I’ll leave that for another day.